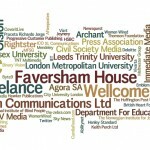 A Wordle showing which organisations delegates attending news:rewired on Friday 19 April are coming from. There are still some tickets available for just £130 +VAT for the one-day digital journalism event. Buy tickets direct at this link. Who is coming to #newsrw so far? 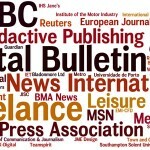 We have created a Wordle to show the companies news:rewired – connected journalism delegates are coming from. 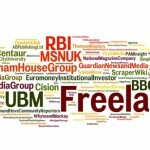 Who’s signed up for news:rewired so far, and where from? Using some simple tools used by data journalists to illustrate stories reporter Joel Gunter has made a couple of visualisations to illustrate who is coming to news:rewired – noise to signal. 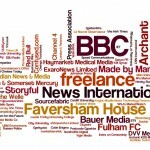 A Wordle illustrates some of the groups and companies sending representatives to our event. We have also mapped the locations some of our delegates to show the distances some people are traveling, including visitors from Romania, Norway and Portugal. The one-day event looked at the processes and technology beyond producing content which could help make journalism more powerful. Sessions included discussions on building a community from scratch, search engine optimisation, linked data and the semantic web and the digital production desk. #newsrw: So who’s coming to news:rewired? We’ve published a list of some of the delegates so far, a mixture of digital editors, freelance journalists and educators working across all sectors of the industry.